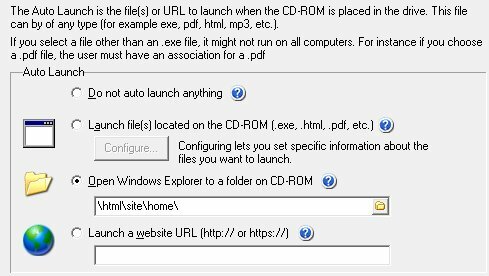 AutoRunWizard.com - AutoRun Wizard FAQ - How can I autorun a file, then Explorer to my CD? 1. When you configure the file(s) you want to run, choose the next file. 2. 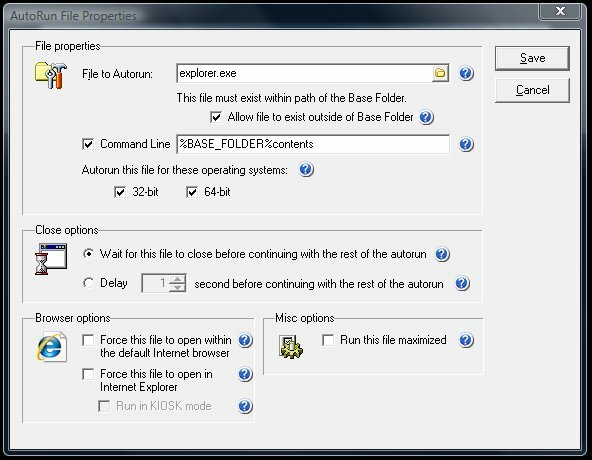 On the AutoRun File Properties type in "explorer" (no quotes) in the File To Autorun 3. Check the option to "Allow file to exist outside of Base Folder" 4. Check the option for "Command Line" 5. Enter %BASE_FOLDER% to open at the root of your cd-rom. Otherwise you can type in the folder path you want to open, relative to the cd-rom room. For example, in the screenshot below we have a cd-rom folder we want to open called "contents". Notice how we referenced the %BASE_FOLDER% with no ending backslash \ and then the name of the folder to open. 6. Click Save and then test your autorun.